Motherwell crashed to their second consective home defeat as Celtic punished a Fir Park side still suffering the effects of their shock cup defeat. Stuart McCall switched up with an unusual 3-5-2, matching Celtic who started with a similar shapre. Simon Ramsden returned to form a three man central defence with Iain Vigurs back in midfield and Craig Moore joining John Sutton in attack. And the plan worked to some extent having nullified the champions threat until just before half-time when Kris Commons made the break through. However, a second goal early in the second half killed the game before Celtic finished the rout with three more goals in the final 15 minutes. Celtic started where they left off at Tynecastle and immdeiately swept into attack, Mikael Lustig forcing a good save from Gunnar Nielsen within the first minute. McCall was forced into a substitution after only nine minutes when Fraser Kerr limped off with Adam Cummins coming into central defence and Ramsden moving to right back. ‘Well then conceded a free kick 20 yards in front of goal but Nielsen smothered Anthony Stokes curling effort at the second time of asking. The home goal was under siege at this stage and Scott Brown appealed for a penalty when his cross cannoned off Stevie Hammell. As the half progressed ‘Well took the sting out of Celtic’s attack and started to make some in roads towards Fraser Forster’s goal. A great move down the left ended with Vigurs whipping in a teasing cross which was just beyond Sutton. Motherwell looked more confident in possssion but just when it looked as if they were heading for the dressing room on level terms Celtic produced a goal from nothing. Stokes, who had pushed Keith Lasley off the ball in the build up, fired a low shot across the six yard box. There looked little danger until Commons, with a terrific backhealer, re-directed the ball past Nielsen. Two minutes into the second half ‘Well created their best chance of the game when Vigurs curled in a free kick and Sutton climbed the highest only to send his header narrowly over the bar. Before ‘Well could sustain any pressure on the visitor’s goal they found themsleves two down. Shaun Hutchison did well to cut out Stokes’ cross but when Charlie Mulgrew delivered the reslutant corner to the back post Efe Ambose towered above everyone to powerfully head the ball under the bar. ‘Well then replaced Moore with Henri Anier as they tried to make an impression on the dominant Celt’s defence. It was the ‘Well defence and Nielsen, though, that found themselves under attack as Celtic pressed to extend their lead. The Fir Park ‘keeper stayed on his feet to brilliantly block Brown from the edge of the six yard box, before doing likewise to deny Joe Ledley. But in the final 15 minutes the ‘keeper was exposed as Celtic added another three. Nielsen, at full length brilliantly palmed away an Izaguirre shot but it fell for Commons who bundled the ball into the net. Two minutes later Teemu Pukki swept the ball across the face of the goal allowing Stokes to drive home number four before Bahrudin Atajic lobbed the ball over Nielsen to make it 5-0 and complete a miserable night for ‘Well. 83mins: A rare venture upfront, Ramsden crossing for Sutton, who is just beaten to it by Ambrose. 76mins: GOAL – Stokes makes it 4-0, counter attack and he slides it home from Pukki’s cross. 66mins: Pukki booked for simulation. Clearly not though from TV footage. A let off. 53mins: GOAL – Ambrose makes it 2-0, heading home, Mulgrew’s corner. 46mins: Ledley almost makes it 2 with a head which whistles just past the left hand post. 46mins: Lasley and Vigurs kick off the second half. 27mins: Bit of attacking play from ‘Well. Hammell and Vigurs combine down the left but Vig’s cross is over hit. 20mins: Hammell handles in the box but ref rules it not deliberate and waves play on. Have seen those given. 16mins: Hutchinson booked for a hard tackle on Pukki. 10mins: Kerr limping off here, Cummins his replacement. “Celtic were terrific and there’s no doubt about that,” said the Motherwell boss. “But, coming up to five minutes before half time, for all the good play they’ve had, I don’t think they’ve had any outstanding chances. “We were digging in and getting blocks. But they’ve got quality players and boys who can bring it out from the back. And they’re playing with a lot of confidence. “The biggest disappointment was the second goal from a set-piece. If you get cut open, which Celtic did many times to us, then you’ve got to hold your hands up. “But it was a bread and butter corner and we don’t pick up. Ambrose scores and thereafter they just picked us off at will and showed what confident form they’re in at the moment. “That’s probably as strong a Celtic side they can be at the moment. They’ve got players playing at the top of their game. “No disrespect, but in the next couple of games we’re not going to come up against Celtic. So it’s down to us to knuckle down and prove we can be in the top three or four and that’s what we’ll aim to do. “We’ll knuckle down and go up to Dingwall next week and hopefully put this to bed. Last week has gone and tonight was a difficult one to take. “But I think sometimes you’ve got to put your hands up and say we were up against a really good side. All you need to do is vote for the Well player you think has been the stand-out performer for November and you could be chosen at random to congratulate our star man in person. The Cash Converters SPL Facebook page will also give you the opportunity to enter the draw to take part in the next Convert for Cash, and the chance to win a whole host of other prizes. Competition closes at 5pm on Tuesday 10th December 2013. The ninth domestic Steelmen Matchday Magazine of 2013/14 is on sale when Celtic visit tomorrow (Friday) night. Picking up the pieces from last weekend’s Cup exit at the hands of Albion Rovers, McCall speaks about the hurt of going out and about his aims and objectives for the rest of this season. The skipper chats about how flat the week has been and what the players have had to do to pick themselves up ahead of the visit of the current Premiership leaders. The feature interview is with Estonian International Henri Anier. The former Sampdoria front man talks about his time in Scotland and how he is looking to draw on the experience of previous disappointments to help get over the Cup shock. The on-loan front man also features as the next in the centre-page souvenir poster collection. There is an 11-page section dedicated to our visitors, Celtic. As ever, Ray Morrison introduces the Parkhead side and there’s a player-by-player breakdown of who is likely to line up for the Hoops. We report from Tynecastle and Celtic’s 7-0 Scottish Cup win and former player Stephen Pearson, who played for both clubs, features in Graeme McGarry’s ‘Us and Them’ section. The former Scotland midfielder talks honestly about some of the regrets he has about how his move from Fir Park was handled, his time at Celtic and what he still wants to achieve in his career. A new column – ‘Football from around the World’ from Ross Dunbar takes a look at the fascinating story of Egyptian side Al-Ahly, who against the odds managed to win the African Champions League despite turmoil in Cairo and a suspension of the domestic league in the country. ‘From the Press Box’ returns with a new host, the Herald’s Scott Mullen and the last of the first round matches is complete in ‘Eggheads’ as young defenders Fraser Kerr and Zaine Francis-Angol square off. Our match reports section takes a look back at the 2-0 win over Kilmarnock two weeks ago. There’s also an in-depth report from the Under 20s disappointing Cup exit to the same team on the same ground. We also take a statistical look at the match official and celebrate the culmination of the ‘It’s a Goal’ mental health course run at the club. Also returning is the ‘Junior Steel’ kids page that will test the youngster’s quiz minds with puzzles and ‘Did you know’ facts. Stevie Hammell has admitted the ‘Well squad have shared a few home truths in the wake of last weekend’s Scottish Cup defeat. Although the Steelmen sit third in the SPFL Premiership table, the disappointment felt by everyone at exiting both Cups in recent weeks has been abundant. 31-year old Hammell, a veteran of 481 games in Claret and Amber, conceded the Albion Rovers defeat was the worst in his long career, but says there is a real determination amongst the squad to try and get back to winning ways against table-toppers Celtic tomorrow. “There’s been a few words spoken since last week and rightly so,” said the Scotland cap. “It’s been a tough week for us, on and off the park, and we have to regroup and focus on the Celtic game now, which will be a tough one. “Cup upsets happen, but a result like last week should not. We have high standards here and that was unacceptable. It was certainly the worst result of my career. “We watched the Hearts game and Celtic’s forward play was really good. We’ve had some good results against Celtic here recently but that’s because we’ve been playing at a high level and playing good football, not just squeezing out a one nil. Stuart McCall has challenged his side to bounce back after ‘letting people down’ last weekend against Albion Rovers. The Steelmen were shocked by the Third Division side at New Douglas Park last Saturday, in what was one of the worst results in the clubs’ 127-year history. There has been little time to mope though as undefeated league-leaders Celtic visit Fir Park for a Friday night showdown. And McCall is desperate for his men to get back to winning ways and hopes to make it a hat trick of home wins against the Parkhead club. Speaking to the broadcast press at today’s pre-match news conference, McCall said: “We’ve had our time of wallowing and feeling sorry for ourselves, but now we need to go out and play football. “I’ve had a whole load of emotions this week, the worst is the sense of despair at letting everyone down, and that will never leave I don’t think. “But I look at the league table and we’ve managed to get 25 points with well over 50% wins, five points better off than at the same stage last campaign. Referee for this Friday’s SPFL Premiership clash with Celtic will be Steven McLean. McLean, the brother of former ‘Well defender Brian, is handling his second Motherwell game of the current campaign. His first was the last time ‘Well turned out at Fir Park – a depleted Steelmen crashed 4-0 to Dundee United. He is a very familiar face to most Motherwell fans having taken charge of six matches last term too. He has had an extremely busy start to the season already – handling eleven SPFL Premiership matches in the first twelve weeks. McLean will be ably assisted by Willie Conquer and Graham Chambers with Brian Colvin on fourth official duties. 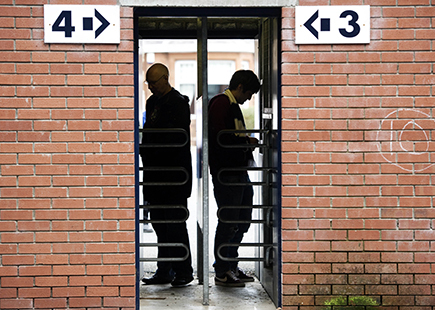 Motherwell Football Club are looking for additional staff for our matchday operation to man turnstiles. Ideal candidates will be able to work to concise instructions and have good literacy and numeracy skills. They must also be available on all weekend matchdays (Friday, Saturday and Sunday) alongside occasional midweek fixtures (Tuesday and Wednesday) – the typical days allocated for matches at Fir Park. In return the successful candidate would be paid above the industry average. Anyone interested please contact Alan Marshall at the Club on 01698 3380683 or email alan.marshall@motherwellfc.co.uk.